We manufacture better quality of pharmaceuticals equipments that are used for producing powders and particulate in the pharmaceutical industry. The pharmaceutical processing equipment includes low capacity dryers designed for specific potent powders as well as industrial size plants for permanent operation under strict hygiene standards. The product applications include preparation of analgesics, antibiotics, enzymes, proteins, vaccines and vitamins. Mass mixers are special pharmaceutical machinery used for through mixing of wet as well as dry or lump material, especially suited for tablet granulation. The Mass Mixer Machine is basically mixing an assembly wherein the mixing stirrer is in horizontal position in the container Mass Mixer & has a single speed, simple rotation. The stirrer rotates around itself at a very slow speed inside the bowl and thereby achieving intimate mixing of dry or wet materials of Tablet Granulation, Powder, Chemicals, and Food & Confectionaries Materials. We deal in manufacturing and export of superior quality mass mixers, that are available in different over flow capacities, working capacities to choose from. 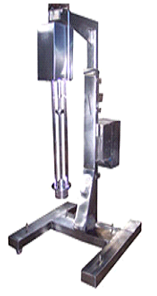 These mixers are furnished with tilting device for easy unloading of the material. Easy to operate and clean, these machines can endure intense conditions. 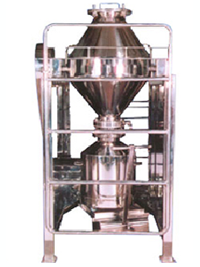 Capacity from 10 Liters upto 3500 Liters, Double Cone Blender is an efficient for mixing dry powder and granulates homogeneously. All the contact parts are made of stainless steel. Two-thirds of the volume of the Cone Blender is filled to ensure proper mixing. It can be used for Pharmaceutical, Food, Chemical and Cosmetic products etc. No of motors / H.P.3 Phase 415 Volts. 1 / 0.5 H.P.3 phase 415 volts. Dedicated fluid heating and circulating systems. These can be steam or electrically heated. Fluid heating systems are available for water as well as thermic fluid. Bodies may be of cylindrical or rectangular cross section. Both shelves and body are heated (the body to prevent internal condensation) with controlled circulation of hot water, steam or dia thermic fluid. Vacuum is drawn through large diameter ducts to minimize pressure drops and produce minimum working pressures. Both rotary and static dryers can be supplied with the following Optional ancillaries. Heater system for either pressurized hot water or dia thermic fluid. Solvent recovery system with condenser and receiver, vacuum pump and ancillaries, characteristics and dimensions depending on the drying processes. 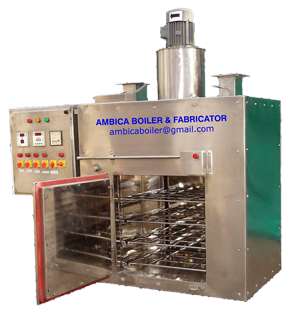 The Dry Heat Sterilizer is used in Pharmaceuticals and Biotechnology for sterilization and dehydrogenation of glassware, containers, vessels, machine and components. We can offer you systems that comply with the most exacting international regulatory requirements for your critical process needs. Our Dry Heat Sterilizers are available in two options - Class 100 and Class 10,000. We also give you a wide range of choices on the chamber capacity, loading configurations and process control and recording. The DHS finds application for humidity sensitive materials such as glassware and metal containers that can be sterilized by steam sterilizers but cannot dehydrogenate the load. At ABF, we assure the performance of DHS meeting the following specifications. STERILIZATION: Reduction of microbial spore forms up to 12 log reduction. The DHS operation is based on hot air recirculation technique. The centrally placed load is subjected to hot air circulation by means of an impeller and heater bank arrangement. Centrally placed impeller ensures circulation via heater bank spaced in the recirculation zone. The efficiency of DHS depends on the velocity and circulation pattern of air within the sterilization zone. · The inner chamber is fabricated from S.S. 316 or S.S. 316L and is fully welded to ensure a crevice free and easy to clean environment. · Temperature Uniformity +/- 5 degree Celsius guaranteed within the chamber for the entire cycle. · STERILIZATION efficiency of 12 log reduction. · HEPA filter of 99.97% performance for clean air. · Extended shaft motor for chamber recirculation. · Positive Pressure throughout the cycle for 100% Sterile integrity of the load. · Automatic plc controlled cycle with user-friendly operator interface for visual monitor and control over the entire cycle. · Blind Temperature Controller for overshoots temperature condition. · From the point of view of chamber safety, the heater bank and fan motor are electrically interlocked. · Door Interlocking to prevent simultaneous opening of both doors. · Door Process lock to prevent opening of doors when process is on. · "Sterile door lock" to prevent sterile door opening unless the sterilization cycle has been successfully completed. · Circulation Blower or heater malfunction alarm. · Automatic Fh Calculator with facility for control in case of heat labile materials. · On-line printing [alpha-numeric and graphical ] for process documentation. · Glassware (Containers such as ampoules, vials etc.). · Containers and metal material. · Machine and accessories used in production. · Various types of humidity sensitive material. Thyristor controlled operation : For efficient control of heater bank, thyristorised operation via PLC can be optionally provided giving an advantage of better temperature control and uniformity. With a view to comply with the latest G.M.P. we put to test the technical expertise of our dedicated engineers to successfully developed the CLASS-100 Sterilization Systems. · High temperature HEPA filters (0.3 micron, performance 99.97%) are installed in the circulation loop to ensure Class-100 environment in the chamber. · Differential pressure indicators for monitoring performance of HEPA filter bank. · Improved filter seating arrangement for maximum filter surface. · New baffle design for uniform airflow and temperature uniformity between the top-bottom and sides of the sterilization chamber. Working Space in mm Cubic Feet Heating Load (kw). ABF research and development efforts resulted in good quality products with excellent and precise process control as per needs of customer and their level of satisfaction. 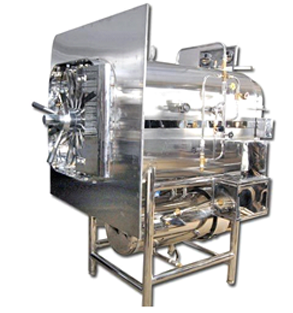 Steam sterilizers are available in different models and for the suitable applications. Vertical sterilizers (Microbiology lab) with swing doors. Horizontal cylindrical sterilizers (Microbiology lab) with conventional radial arm. Horizontal rectangular sterilizers with conventional radial arm and also with sliding doors. All models are available with SINGLE/DOUBLE door design except vertical which is available only with single door. Specially designed chamber to ensure complete condensate removal. Specially designed connector/nozzles sanitary type to avoid any chances of contamination. Special welding technique to avoid welding depressions inside the chamber. Excellent chamber finish with crevice free construction to avoid chances of contamination. Sterile air filter (0.01micron) for vacuum break is provided on sterile side. Automatic control with PLC based Sterilizer control panel. Both doors will not open simultaneously. Both doors will not open when process is on. 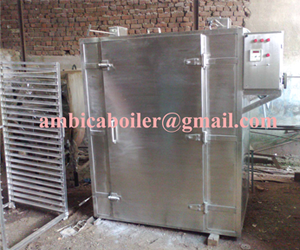 We are manufacturers of triple walled horizontal autoclave India since 1991. 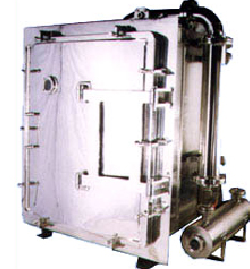 Our horizontal autoclave are widely used for day to day mass scale sterilization procedures and in various bulk laboratory applications, where dryness of the sterilized medium is of paramount importance, given the fact that semi dry sterilized media is prone to various micro-bacterial and viral infections. We specialize in both standard and customized models, specifically designed to meet the challenging demands of various scientists for individual and specialized research applications. 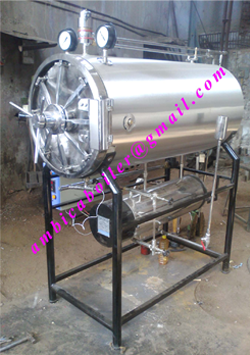 Over a short period of time ABF brand have been established as reliable manufacturer of horizontal autoclave in India, catering to the vast market of India Apart from that we are supplying our autoclave in India , catering to a variety of customers ranging from Defence Installations, Research Laboratories, Educational Institutes and various R and D laboratories of leading national and multinational companies.